Royal Coachman, Alaska | Tailwaters Fly Fishing Co. 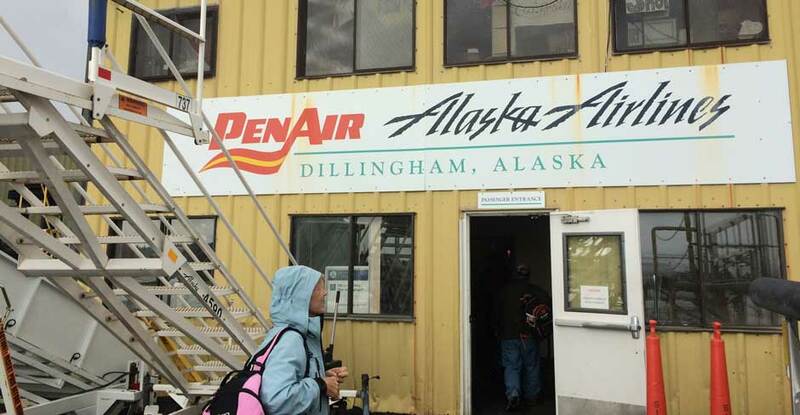 Guests travel commercially to Anchorage, AK and connect onward to Dillingham (DLG) on board Pen Air commercial mid morning. Guests typically must spend Saturday night in Anchorage before pushing onward to Dillingham Sunday morning. Each day, anglers fly out from the lodge to different rivers or lakes of their choosing. Anglers enjoy float trips, walk and wade trips, larger freestone rivers accessed with jet-sled Jon Boats, lake fishing, and more. Choosing a date to fish anywhere in Western Alaska depends on what species of fish you would like to target. Fishing is excellent any time in the season, but the conditions and species available vary from month to month and may impact when you decide to visit. All months are excellent for viewing wildlife. (See WHEN TO GO for more details). Is Royal Coachman Right For You? Royal Coachman’s laid back and flexible fishing program welcomes anglers of all skill levels, genders and fishing preferences. RCL is the perfect lodge to consider for folks who are looking for a fly out operation with a small lodge and un-crowded Alaskan fishing . . . both are very rare these days! RCL has a loyal return clientele that makes openings hard to come by, so plan to book far in advance. Fair warning – Royal Coachman Lodge has done such a superb job with its operation that it has a very loyal repeat clientele, and openings can be difficult to come by. Plan to book far in advance! You will NOT be disappointed. Royal Coachman Lodge is located in the heart of the world famous Bristol Bay region of Southwest Alaska. The lodge sits on the banks of the Nuyakuk River in the middle of the Wood River Tikchik State Park – the largest state park in the nation with 1.6 million acres of land. The Park is adjacent to the Togiak National Wildlife Refuge. Both the Park and the Refuge provide exceptional fishing, but also offer some of the largest wildlife and birdlife populations in Alaska. 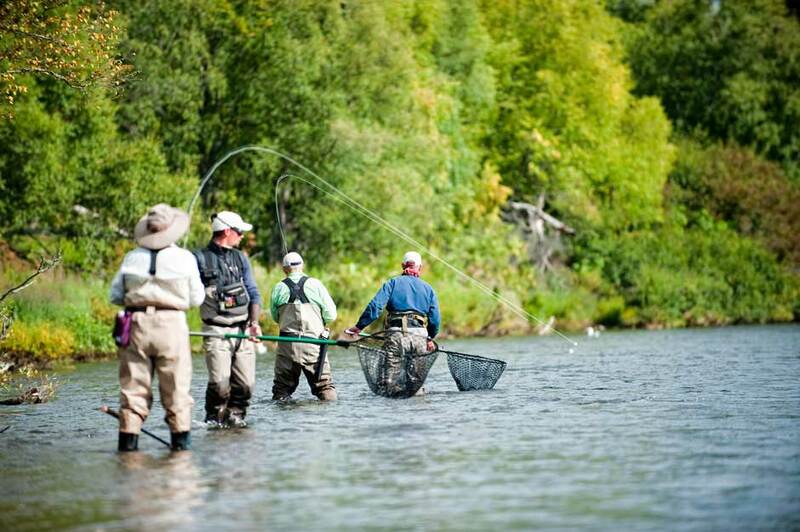 During a week with Royal Coachman, guests will fish waters in the Park, the Refuge, and a variety of other rivers throughout southwestern Alaska. 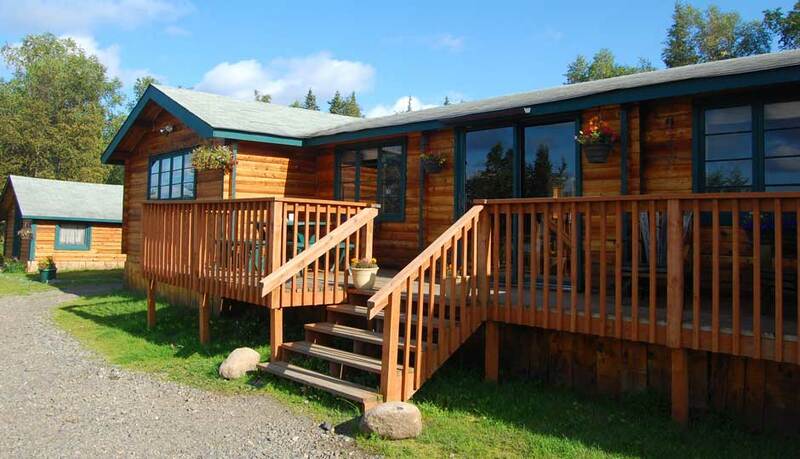 Royal Coachman is a small lodge by Alaskan standards, only catering to 10-12 guests per week. Their intimate and flexible program is designed to get away from the crowds now associated with so many Alaskan lodges these days. Their fisheries are un-crowded and you’ll have the river all to yourself. Royal Coachman focuses on a wilderness experience, and strive to fish areas no one else does. They carry nine different permits and leases to ensure that you will have outstanding fishing and the wilderness experience that has become so rare in many parts of Alaska. This area of Alaska is accessible only by floatplane. Most fishing lodges in Alaska are located in small towns or native villages. But Royal Coachman Lodge is 65 air miles north of Dillingham and totally isolated in the midst of a vast Alaskan wilderness. While its home water offers incredible fishing out the back door, Royal Coachman is a fly-out lodge that utilizes two de Havilland Beaver aircraft to access an exclusive range of over 75,000 square miles targeting as many as twelve different species. When everything is fishing well, Royal Coachman almost has too many fishing options available. Imagine trying to decide whether to fish for 25 pound pike on the surface, salmon covered with fresh sea lice near the coast, hike small creeks for arctic char in the mountain lake streams, rainbows and dollies on the Nushagak, Agulapak, Kvichak, etc., or a mixed bag of grayling, lake trout and rainbows on RCL’s home river. That’s the dilemma Royal Coachman guests must face each day. By hosting just 10 – 12 guests per week, Royal Coachman has the flexibility to go where the fishing is the best for what you want to fish for, not where a pre-determined schedule needs you to go. Additionally, they have bear viewing, hiking, and kayaking options for those who’d like a change of pace or just need a day to rest a sore fishing arm. As a small operation, Royal Coachman Lodge has the flexibility to cater to both the serious and the more laid back fisherman. Customization is the key to their fishing schedule. Every evening the lodge manager will sit down with all guests and go over plans for the next day. With nearly 20 boats (aluminum Jon boats with 40HP jet units) scattered throughout the region, and many rivers where you do not need a boat, you will have an amazing number of fisheries to choose from everyday. You can drift fish from the boat or wade fish depending on your preference. If you are on a creek that does not have a boat, your guide will carry lunch in a backpack and you can wade fish the creek for the day. All they need to know is what species you would like to focus on for the day, and if there is a particular river that you would like to fish, and their team will help pick the best fishery for you. 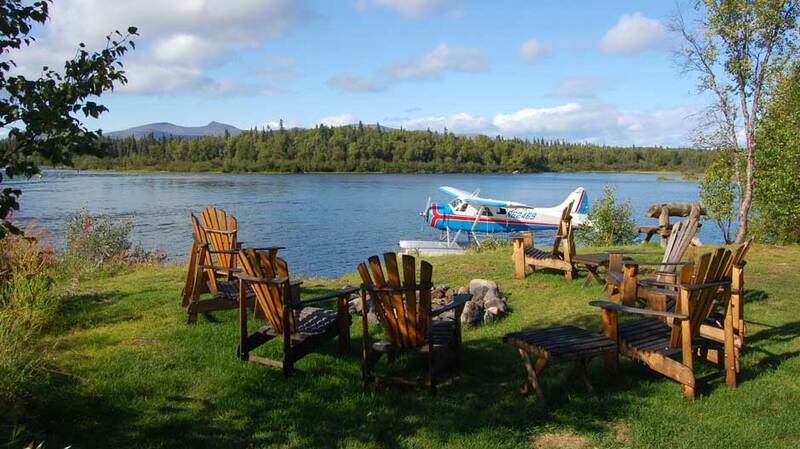 How many fly out lodges in Alaska take only ten guests a week? Unlike many lodges where guests are segregated from the lodge and guide staff when not on the water, Royal Coachman operates a small and intimate operation where you will get to know the crew. Between fishing all day with the guides and eating dinner together, the team becomes more your friends than just your guides. Royal Coachman goes where the fishing is the best. It has taken decades of fishing in this area to master the timing of each fishery. Coachman will fly and fish an area that is 250 miles across. With the combination of 25-30 fisheries and their local expertise, you will have the best fishing possible no matter when you come. The staff will sit down with you every night and make sure that your next day of fishing meets your expectations. With only 10 guests, and so many great fisheries, it’s impossible to fish them all in a week. Coachman guests catch at least 12 different species of sport fish during their season. Whether you want to sight fish for King Salmon, throw a mouse pattern to a 25+ lb pike, drift fish for big rainbows, or catch a rare sheefish, they can do it. Every day will be a different experience. The Nuyakuk is the home river – and RCL is the only operation on it. The lodge sits on a grandfathered property in the Wood Tikchik State Park. There is a class 5 rapid above and below the lodge, and no roads within 60 miles. You can only get to the lodge by floatplane (not by boat or car). This means that if the weather prohibits flying, you will still enjoy great fishing. It also means that when you are sitting at the fire pit looking over the river watching the sunset, you will never see another boat go by. THE DAILY ROUTINE . . . THERE IS NOT ONE! Each day begins with a hearty breakfast (if you are an early riser coffee is set out beforehand). An hour after your breakfast you will depart for the day’s fishing. The guides will pack a picnic lunch, or if desired they can do a streamside lunch of fresh salmon (when available). The daily fishing schedule departure times are flexible to maximize your fishing success. Pickup time will vary depending on the groups desired plans for the day. Remember that at the end of the day, if you have not gotten enough fishing in, you can always fish in front of the lodge. Dinnertime is between 7 and 8 pm and all the anglers will return to the lodge one hour prior to dinner, so you’ll have time to shower, relax and enjoy hors d’oeuvres. You’ll enjoy a generous dinner served family style, followed by a gourmet dessert. On the Sunday exchange days, you can often get some morning fishing time in (usually unguided). All five species of Pacific salmon – king, sockeye (red), pink, silver, and chum – spawn in the Wood River and Tikchik systems. Rainbow trout, grayling, lake trout, arctic char, dolly varden, and northern pike all thrive throughout the area watersheds. If desired you will fish for each of these species at different locations throughout the park. The park is home to a remarkable wildlife resource. Moose, caribou, and brown bear are found throughout the park. In addition to these large mammals, you will also see beaver, muskrat, otter, fox, wolverine, mink, and porcupine. There are also healthy populations of ground squirrels and marmots throughout the Park. Like much of Alaska, the birdlife in the park is abundant. During the week, you will likely see a variety of ducks, gulls, bald eagle, golden eagle, arctic tern, various loons, spotted and least sandpipers, semi-palmated plover, willow ptarmigan, and spruce grouse. During your week, you will spend at least a couple of days fishing the Togiak National Wildlife Refuge. Royal Coachman has three permits to operate within the Refuge. One permit allows them to fish the Kulukak River for salmon, one gives them access to the Togiak River, and the other permit authorizes them to fish the wilderness lakes portion of the refuge. The fishery resources of the Togiak National Wildlife Refuge are among the best in the world. Specifically, the rivers and lakes of the refuge are home to resident populations of rainbow trout, arctic char, arctic grayling, lake trout, northern pike, as well as 22 other fish species. The rivers and bays of the refuge are also home to one of the world’s most robust anadromous fish resources in the world. All five species of Pacific salmon are found within the refuge and serve as the backbone for much of the terrestrial and aquatic life within the refuge. In total, approximately 3 million Pacific salmon return each year to the habitat protected by the refuge management regime. The Refuge is also home to at least 30 species of terrestrial mammals and over 200 species of birds. Ranging from brown bears and caribou to the little brown bat, the wildlife relies heavily on the habitat protections provided by the refuge as well as the continued health of its fishery resources. One of Royal Coachman’s underlying objectives at the lodge is to provide a quality fishing experience which emphasizes professional guiding, but also educates fishermen about the natural diversity of the Togiak National Wildlife Refuge. The Royal Coachman Lodge sits on the banks of the Nuyakuk River. Their small lodge caters to a maximum of 10-12 anglers per week (with 10-12 people on staff). This small number of guests and large staff helps to ensure that you will have the maximum amount of personal service and attention. The Coachman has four finely furnished guest cottages, one and two bedrooms, and private baths. They also have one well-appointed bedroom in the main lodge. Each cabin or room has modern bath facilities, independent heat, excellent beds, and all the creature comforts of home, along with spectacular views of the river and the rapids. The lodge can sleep 12 guests, so you will have a lot of choices from single cabins, to family cabins. 110 electricity is provided by diesel generator. The main lodge houses the kitchen, dining room and lounge, library corner, one guest room with a private bath, and massage room. Comfortable and cozy, this is where you will plan the next day’s excursion. You and your guides will sit around the fire, decide what type of fishing you would like to do, and plan the details of tomorrow’s outing. There is no pre-scheduled fishing program here. Custom tailoring each day’s fishing is one of the major advantages to Coachman’s personal approach to fishing Alaska. Royal Coachman Lodge prides itself on the quality and abundance of the food that is available to its guests. Freshly baked bread, rolls, and pastries are served at each lodge meal. Fresh fruit and vegetables are always available. Dinner menus vary but typically include New York steak, turkey, prime rib, halibut, a variety of Alaskan seafood, and similar items. Lunches are prepared by the lodge kitchen staff and are often supplemented by fresh fish cooked on the stream bank. You won’t find better food at any fishing lodge in Alaska. Guest rooms are cleaned daily. The lodge does not have laundry service available for clients. Please do not plan on the crew having time to do personal laundry. Alcoholic beverages are not sold at the lodge. Given its location in the park, Royal Coachman is not allowed to sell alcohol, and alcohol is not included in the package. If you would like to place an order to have at the lodge when you arrive, we can help you arrange it. If you do not order alcohol, there will be no alcohol available for your group. Tailwaters will assist in gathering your alcohol order and delivering it to the lodge. The first leg of the trip is accomplished by guests reaching Anchorage, Alaska, which is serviced by many commercial carriers. Most guests will need or want to spend the night in Anchorage at one of our recommended hotels on Saturday, before traveling to the lodge on Sunday. The second leg of the trip is a one hour thirty minute ride aboard the local carriers Pen Air or Alaska Air to Dillingham, Alaska on Sunday. 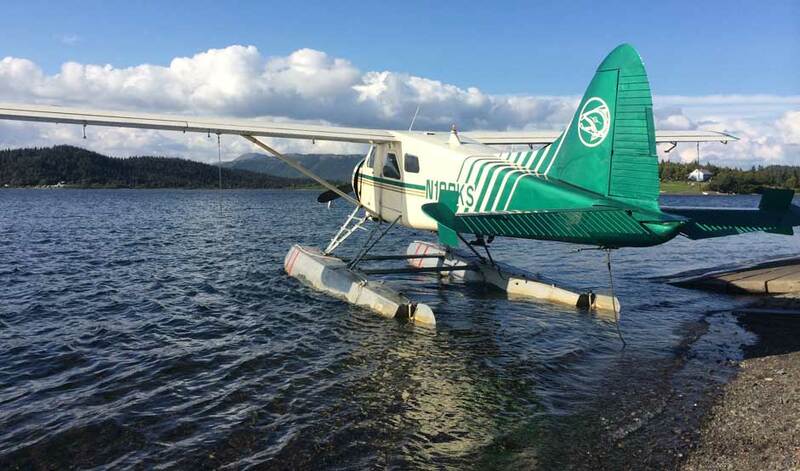 From Dillingham, guests are transported by ground transfer approximately 45 minutes to nearby Lake Aleknagik, where the lodge’s float planes will be waiting to load up and head into camp. The following Sunday, guests are transferred back to Dillingham for the flight to Anchorage with Pen Air or Alaska Air. There is no additional overnight required in Anchorage en route back to the lower forty-eight, and most commercial flights are “red-eye” overnight flights arriving home early the following morning. Depart from Anchorage mid morning on Pen Air flight to Dillingham. After a 1.5 hour flight, land at the Dillingham airport where a Royal Coachman Lodge staff member will be waiting. Guests are then transferred in the Royal Coachman Lodge’s van to Lake Aleknagik where lodge floatplanes will be waiting. This transfer takes about 30 minutes. The staff will pack the plane and leave for the lodge as soon as you arrive. Appetizers and a healthy dinner are served around 6:30 p.m. Upon arrival the manager will discuss the week’s itinerary, check and/or sell licenses, and guests sign liability waivers. Full fishing days! Guests will generally have breakfast at 7:00 a.m. and depart at 8:00 a.m. You will return around 6:00 p.m. after a full day of fishing. Dinner is usually served at 7:30 p.m. Repeat! Luggage is packed onto the planes and flown to Aleknagik while guests have breakfast. After the luggage plane leaves, guests will have time to settle up with the manager for expenses, which may include fishing licenses, apparel purchased, and gratuities. At roughly 10:45 a.m. guests depart on the floatplanes for Aleknagik and onward to Dillingham. Guests will need to be on the Pen Air flight that departs Dillingham at roughly 1:45 p.m. This flight arrives in Anchorage at roughly 3:15 p.m. We highly recommend you do not book a flight out of Anchorage before 5:00 p.m. There is no additional overnight required in Anchorage en route back to the lower forty-eight, and most commercial flights are “red-eye” overnight flights arriving home early the following morning. Choosing a date to fish anywhere in Western Alaska is completely contingent upon which species of fish you would like to target. Royal Coachman Lodge is open from early June through early October. Fishing is excellent any time in the season, but the conditions and species available vary from month to month and may impact when you decide to visit. All months are excellent for viewing wildlife, and anglers often find themselves sharing the river or stream with multiple grizzly bears doing a little fishing of their own. 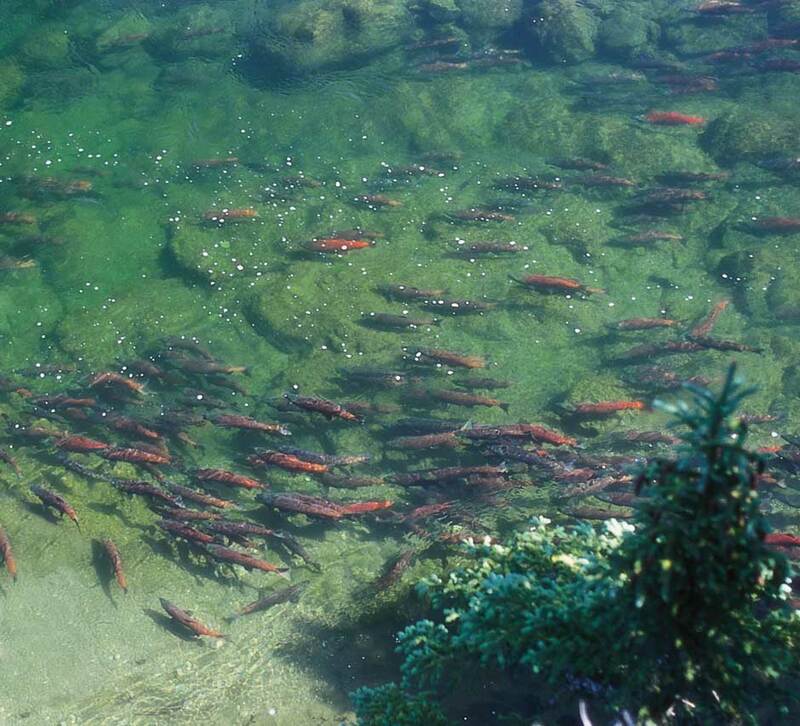 The month of June is marked by the arrival of the mighty chinook or king salmon and the mass exodus of salmon fry heading down stream to the ocean. 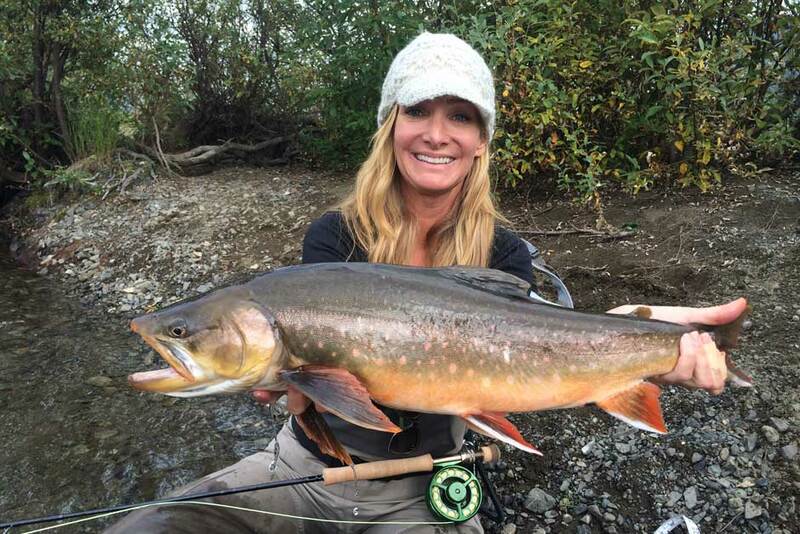 Trout fishing during this period is typically excellent and perhaps the best time of the year to experience some of Alaska’s dry fly-fishing for rainbows as well as swinging flies and trolling for chinook salmon. The highlight of the month are the huge rainbows! After a full summer of feeding on salmon eggs and flesh, rainbows are at their fattest weights of the year. The salmon runs are complete by the end of the month and the biggest rainbows are still on the move feeding on anything they can grab in anticipation of the conclusion of the gluttonous summer. 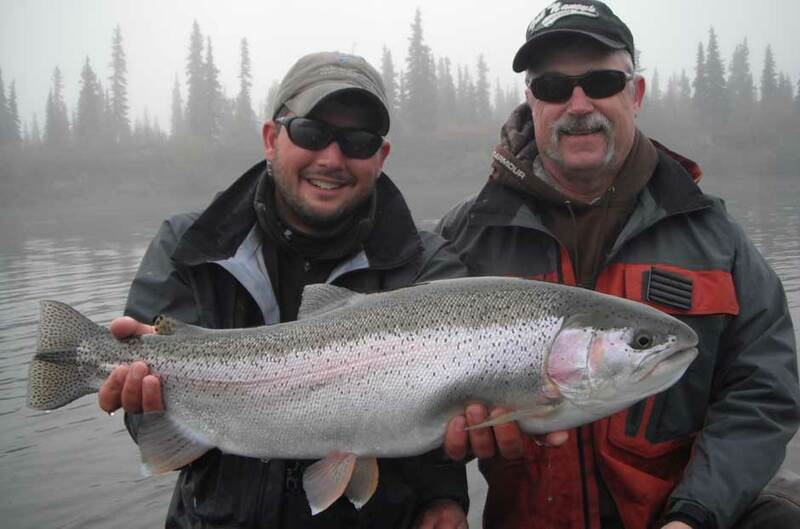 September and early October offer the angler the best opportunity to catch a real legendary monster Alaskan Rainbow. The weather is about the only thing you CANNOT count on with your trip to Alaska. Guests must plan on every type of weather to occur at anytime. Daytime temperatures range from cool to hot and rain showers can occur at any moment. On any given day you could see hot weather turn to cold, calm turn to windy, and sunny to rainy almost before your eyes. If you decide to visit Alaska a rain jacket is an absolute must. Typically, June and July are a little warmer and drier than August and September. Although fishing is the predominant activity at Royal Coachman, we encourage non-angling companions to visit the lodge as well. Perhaps the best way to see Alaska’s beautiful wilderness, landscapes, and wildlife is on a fly-out fishing trip. Although daily activities are oriented around fishing, guests at RCL can detour to enjoy some wildlife viewing, hiking, and kayaking options for those who’d like a change of pace or just need a day to rest a sore fishing arm. Wildlife encounters and photographic opportunities are everywhere including daily sightings of bears as well as wolves, moose, bald eagles, and other bird life. Royal Coachman is by no means a pretentious “fly fishing only” program. Beginner anglers are welcome and encouraged to use spinning equipment instead of fly rods if required to make guests more comfortable and successful. Get ready to see a lot of bears! Wood Tikchick & Togiak have one of the densest populations of brown bears in Alaska. First time Alaskan anglers are blown away, but by the end of the week bears are almost an afterthought. Nearly every river system is flooded with brown bears during the annual summer run of salmon. You will share the river with bears (who are also fishing) just about every day. Coachman guides are well versed in bear etiquette, and will train anglers on the proper protocol when bears are encountered. Although the guides are armed with shotguns in bear country, bad bear incidents are very rare in Alaska. Bears typically want to avoid a close encounter as much as you do, and they are a memorable and integral part of the Alaskan fishing experience. Group discounts available for groups of four or more and ten or more. A non-refundable fifty-percent (50%) deposit is required at the time of booking to confirm all reservations. All trips must be paid in full 90 days prior to departure day. A deposit may be transferred to another person who is not booked at the lodge for the current season. Deposits are refundable for cancellation only after/if the cancelled space has been filled at least 90 days prior to trip dates. Refunds are not granted for non-flying days due to weather or reasons out of the lodge’s control. Hotel rooms, or food expenses due to weather delays getting to the lodge in Dillingham or Anchorage are not Royal Coachman’s or Tailwaters Travel’s responsibility. Refunds of deposits/payments made on credit cards will be charged a 3.5% service charge to fully compensate Tailwaters Travel for all bank charges incurred. Receipt of deposit and/or final payment is acknowledgement that registrant has read and accepts the cancellation, refund and responsibility clauses.